AIM Academy 5th grade students traveled to Ziegler Elementary School in northeast Philadelphia on January 12th to read books to students in Kindergarten – 2nd grade and deliver "at home book packages" featuring favorite titles donated by AIM's 1st – 5th grade Lower School students. The book delivery and school visit were the culmination of the students' service project in honor of Martin Luther King Jr. Day. The visit to Ziegler was also a way for AIM Academy students, who have language-based learning differences such as dyslexia and dysgraphia, to develop a relationship with Ziegler's students, many of whom are learning literacy skills using the same evidence-based methods taught in AIM's classrooms. "The AIM Institute for Learning & Research has been working with educators at Ziegler for the past three years sharing our Integrated Literacy Model with teachers and students," said Suruchi Keenheel, Director of Instructional Coaching and Training for the AIM Institute. "We are pleased that our AIM Academy students are forging a new relationship with Ziegler students by sharing their love of reading and providing K-2 students with packages of books to enjoy at home." In preparation for the visit to Ziegler, Lower School students were asked to bring a copy of their favorite book to school with a note written inside the front cover as to why the book is special to them. Thanks to the support of the entire AIM community, close to 500 books were collected. 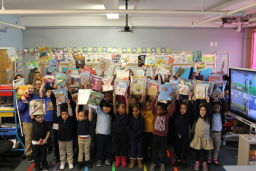 After spending 30 minutes reading to Ziegler students on Friday, AIM students provided the approximately 180 K-2nd grade students with an "at home book package" including a pencil, a bookmark and two to three books. The students were excited to page through their new books and were eager to take them home. Ziegler teachers appreciated the opportunity for students to read together in small groups of 3 to 6 children as two AIM students read their chosen books to students. "Our 5th graders read with fluency, accuracy and confidence," said AIM teacher and project organizer Eryn Doroshow. "The goal of our visit and the book collection was to increase Ziegler students' access to literacy during all parts of their day," explained AIM Lower School Head Allison Enslein. "This important endeavor helps our students gain confidence in their reading and helps to cultivate an attitude of gratitude helping our students think about gratitude in terms of what we give instead of what we receive."